J R R Tolkien is one of the most revered authors in the history of fantasy fiction, and rightly so... he's one of the best in the genre. 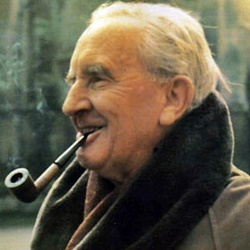 Tolkien's work in The Hobbit and The Lord of the Rings made him known, but his storytelling ability and his unmatched knack for creating fictional languages and fantastical worlds made him a legend in the literary world. His works span the young adult and childrens fiction genres, poetry, tales of Middle-Earth, short stories and a variety of manuscripts that were published after his passing. J R R Tolkien worked at Pembroke College as a professor from 1925-1945, after returning home from serving in WWI. From 1945-1959, he was a professor of English Language and Literature at Oxford. There he became close friends with C.S. Lewis, who was a fellow member of a literary discussion group called the Inklings. After Tolkien's death in 1973, his son published a series of works based on his unpublished manuscripts and notes. The Silmarillion, The Hobbit, and The Lord of the Rings trilogy are a collection of tales, poems, invented languages and histories and literary essays that came from those notes and manuscripts. His work has inspired many more recent fantasy novels. There are a number of spin-offs and other works derived from both The Hobbit and the Lord of the Rings trilogy. And, as many writers aspire to reach the level of success they feel Tolkien has achieved, it's no wonder he's still widely referred to as the 'Father of Modern Fantasy'.